including all SQL Server source code. Lean provide install/training and Case flow development as required. LCF Law is a long-established firm of solicitors in the West Yorkshire area with offices in Bradford, Leeds and Ilkley. until everything is correctly in place, the case cannot progress too far. This allows the fee earners to get on with the legal side and the admin team to process the paperwork. With the reminders that can be generated we can give the client/other side a gentle nudge for them to return the requested details." GAIL is being used as the foundation platform for new Collaborative Workflows, available to all Partner for Windows Clients. Initially the collaborative workflows are being developed with Braddon & Snow in Hertfordshire. ARE YOUR LEGAL CASE FLOWS PROACTIVE ? ARE YOU TRACKING AND AUTOMATICALLY CHASING ITEMS EFFICIENTLY ? ARE YOU ABLE TO FILE DOCUMENTS ACCURATELY ? Commonly legal case flows lend themselves to the concept of one or more Awaiting Items, for example Awaiting Deeds from <entity name> or Awaiting Proof of ID from <entity name>. A well designed Generic method of handling Awaiting Items can be the driver for your case flows, and the backbone of flow logic. GAIL Awaiting items are linked to partner Entities, so at any time you can see what you are waiting for and from whom, with the ability to automatically chase the items as you require. Any number of Awaiting Items can be applied as precedents to a step, for example defining a number Awaiting Items as 'must be received before the step Exchange Contracts'. GAIL allows you to easily integrate entity linked "Awaiting Items" into legal case flows, saving a great deal of P4W maintenance and considerably improving the effectiveness of a P4W caseflow. Awaiting items can be inserted into the flow by SQL code without having to create an Awaiting Item step. For a particular case type (for example Domestic Conveyancing Sale) the first thing to do is to identify all of the items that we request from all of the entities involved. The template controls the behavior of events such as Receive, Process and Chase. In the example above, when the item is taken the step 'PRO Further Enquirers' will be inserted into the workflow. There are two ways of inserting Awaiting Items, either using the generic awaiting step, or making use of an existing Awaiting step you may have allready built. GAIL includes a very easy way to insert an item, simply by calling a stored procedure from a Partner step. In this example we insert four generic waiting item steps, for a Client Care Letter, Money on Account, Proof of ID, Proof of Address, SDLT Questionnaire. As you can see the step name included the Item Description and the relevant Entity name. Taking any of any these generic awaiting item steps provides a list of common options, including mark as received, receive and process. GAIL also includes functionality to chase all items for an entity, by letter, email or SMS text. This is where GAIL brings a great deal of benefit to you by progressing case flows and getting documents into your practice in the minimum of time. We would create a server script to do this for you - an daily module would need to be modified for your needs and may include chase by Letter, Email or SMS text. The solution here would depend on your existing software. 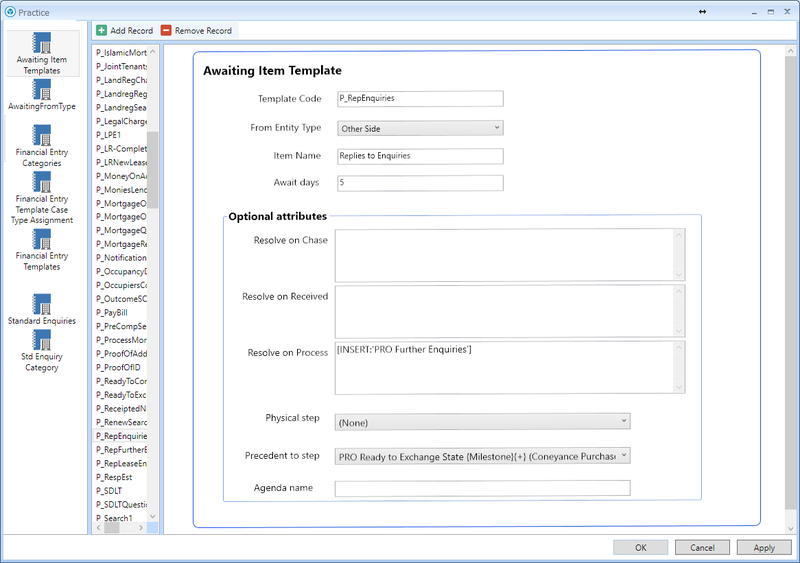 The lean GAIL software pack consists of suite of SQL stored procedures and pre-built Partner steps, allowing you to quickly get up and running with a more streamlined and efficient case flow. The stored procedures themselves are generic and you may find to be very useful in other parts of your case flows. Would you like an online demonstration of GAIL? contact us, we can help you with integrating GAIL with your existing or new P4W case flows. Lean provide software and Documentation download, and optionally : install, training, on-site or remote assistance and further development as required. 15/01/2018 3.0 Software improved in many areas. Supporting Requested status, Chased status, Received status, Processed status. 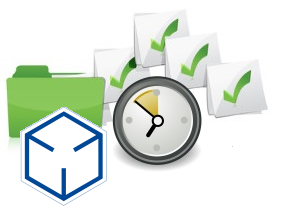 Improved support for scanning software - integration invloves simply updating the received date. 03/04/2018 3.1 Linking Awaiting items to documents received - (PDF/Image) Filing.